President Donald Trump said Thursday the United States is recognizing Israeli sovereignty over the Golan Heights, the Syrian territory it captured in 1967's Six-Day War and has controlled since then. Trump, in a Twitter comment, said the Golan Heights "is of critical strategic and security importance to the State of Israel and Regional Stability!" Netanyahu has accused Iran of attempting to launch attacks on Israel from the Golan Heights, saying, "I think for this reason and many more, it is time that the international community recognizes Israel's stay on the Golan, and the fact that the Golan will always remain part of the State of Israel." "President Trump has just made history," Netanyahu said after calling the U.S. leader. "The message President Trump has given the world is that the United States stands by Israel. We are deeply grateful for the U.S. support." Last week, the U.S. State Department, in its annual human rights report, dropped the phrase "Israeli-occupied" from the Golan Heights section, instead calling it "Israeli-controlled." Pompeo told reporters the change in terminology was not accidental but rather a reflection of the reality on the ground that the Jewish state controlled the territory. Pompeo accused Tehran of seeking the "annihilation and destruction" of Israel. "With such threats a daily reality of Israeli life, we maintain our unparalleled commitment to Israel's security and firmly support your right to defend yourself," he told Netanyahu. "I think it's symbolic that a senior American official go there with a prime minister of Israel," Pompeo said. "It's a place that's important to many faiths, and I'm looking forward to it. I think it will be very special." 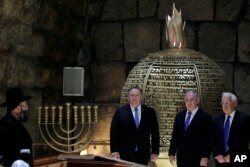 Israeli Prime Minister Benjamin Netanyahu, center, U.S. Secretary of State Mike Pompeo, left, and U.S. Ambassador to Israel David Friedman visit the Western Wall Tunnels in Jerusalem's Old City, March 21, 2019. The Western Wall website says that the tour of the tunnels "allows visitors to reach the segments of the Wall hidden from view, and to touch the original and special stones that tell the story of the Jewish nation." Nabil Abu Rudeineh, spokesman for Palestinian President Mahmoud Abbas, criticized Pompeo's visit to Israel absent any corresponding plans to meet with Palestinian officials. "While they are claiming to be trying to solve the conflict, such acts only make it more difficult to resolve," he said. Pompeo said, "The Israelis and Palestinians live side by side. We need to help them figure out how to do that. It's a fact, and this administration wishes well for the Palestinian people." Trump is meeting with Netanyahu in Washington next week. Netanyahu's government is headed to a tough April 9 re-election contest as the prime minister is embroiled in a corruption investigation and faces allegations of bribery, fraud and breach of trust. Netanyahu has called the case against him a political "witch hunt."